March Madness is upon us. Colleges from all over the country are competing for the title of “NCAA Champion”. Emotions are running high and it’s quite an exciting time for players and fans alike. People of all backgrounds connect over the love of basketball. 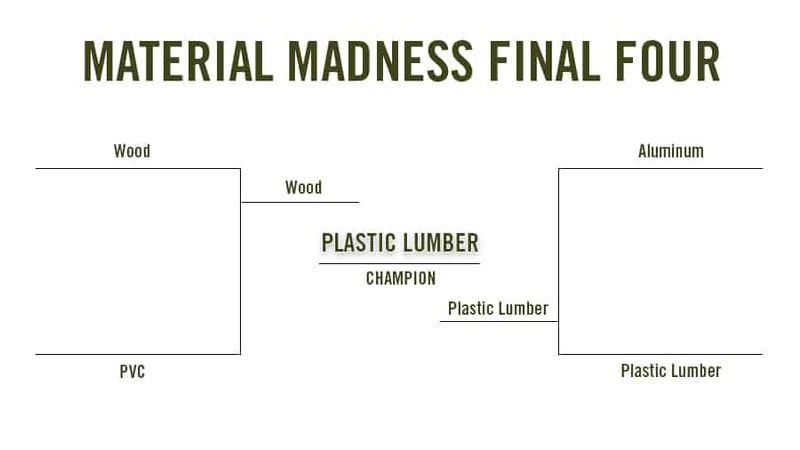 To commemorate this annual event, we have created a “Material Madness” bracket, and the final four teams have been announced: Wood, Aluminum, PVC and Plastic Lumber will compete for the title of “Material Champion” in the Construction Tournament. The four building materials are ready to compete for the title. Let’s meet the teams and get a material break-down. PVC (PolyVinyl Chloride) is one of the most common types of plastics produced in America. Simply put, this material is manufactured by combining ethylene and chlorine which produces ethylene dichloride, which is then processed to create vinyl chloride. This is then combined with a vinyl resin to create PVC. This building material is found in many types of applications, most often piping and siding, tubing, medical devices and automobile parts. Polyvinyl Chloride is a rigid building material that has a whole playbook of applications under its belt. It is lightweight and strong and easy to install because it can be cut and shaped in a variety of ways. It does not conduct electricity so it is often used for insulation and wire covers for electrical applications. It is also fire resistant in that when the source of burning is taken away, it will self-extinguish after a period of time. While PVC is a versatile and tough building material, it does have its shortcomings. For example, PVC doesn’t do very well in cold temperatures because it can become brittle and crack, leaving sharp edges exposed that can cause damage and injury. The manufacturing and burning of PVC can have harmful effects on the environment because dioxins are released into the air, which is a highly toxic compound. Due to these weaknesses, PVC has reached its foul limit in many countries around the world, and policies have been instated to reduce the use of this material in construction and building projects. Traditional wood has worked really hard to get to the final four. As a powerhouse building material, wood is used for all types of applications in different industries. Originating from the natural environment (forests and other wooded areas), traditional wood is very close to finished product status once it has been harvested. It can be cut down, planed and sanded, but doesn’t require much preparation. Material enhancements can be added to increase performance and endurance, and different types of wood are better-suited for different applications. For example, hardwoods like oak, birch and elm are primarily used in applications that require structural stability and these products often have chemical coatings to increase the life-cycle of the wooden boards. Traditional wood has many strengths that make it a fierce competitor in the building material world. There are two main types of wood; hard and soft. Hardwoods are more dense, which increases strength, the ability to hold more weight and less contraction and expansion occurs during temperature fluctuations. Softwoods are more abundant, strong and typically cost less than hardwoods. Traditional wood also offers acoustic properties which help drown out sound and echoes and is great for applications like floors, ceilings and walls. While this material is excellent for many construction projects, it doesn’t contain the same level of endurance as other contenders in this tournament. If wood is exposed to consistent moisture over long periods of time, it can rot and mold and will need a substitute. Once the wood rots, the strength properties diminish, causing the need for replacement. Not only is wood capable of rotting, but it also has a tendency to crack and splinter in extreme heat and cold. In many applications, traditional wood and PVC can go head-to-head as the chosen building material. In this match-up, PVC started off very strong, scoring many points in the first quarter for durability, strength and ease of installation. The plastic contender is a cost-effective building material that can outlast harsh weather and has a long shelf-life. It wasn’t until the second half that traditional wood started to make a comeback. 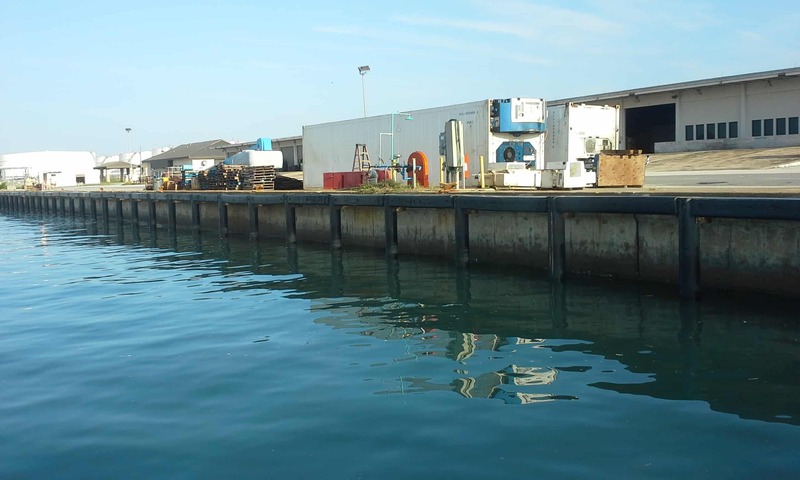 Traditional wood kept a steady pace throughout the project life-cycle and was able to take the “win” due to PVC fouling out, and ultimately getting disqualified. Due to the harmful effects on the environment, enough countries and regions set in place policies to reduce or eliminate the use of PVC in construction projects and traditional wood won. Aluminum is a strong contender in the final four tournament because it is the most common metal found within the earth’s crust. It is mined from the ground and then chemically refined to produce the final product. Aluminum is one of the easier metals to produce, making it very abundant. When aluminum is not competing for a championship title, it is commonly found in building construction, structural support and doors and windows. This material madness contender has been rising in the ranks in construction use because of many benefits. One of these benefits includes a lightweight material that is 66% lighter than steel. It is resistant to the cold weather, unlike traditional wood and doesn’t become brittle when exposed to cold temperatures. It can be manufactured quickly and doesn’t require much further preparation, and has an exceptional strength-to-weight ratio. This is why aluminum is commonly used in roofing and structural applications like wall panels and building archway supports. While aluminum is one of the most durable metal building materials, it also is a high thermal conductor, which makes it less appealing for thermal insulation applications. Fastening this material can also be a bit of a challenge because some applications require welding, which must be very precise to avoid corrosion and seam leaks. It also requires special tooling and a certified crew to perform the welding, which can raise project costs. HDPE plastic lumber is the underdog in the tournament. As a newcomer in the building material space compared to the other contenders, plastic lumber has a lot to prove. Demonstrating that it is worthy to be in the final four is only the beginning. Plastic lumber is sourced from post-consumer and post-industrial recyclables like milk jugs and laundry detergent bottles. As a structural and durable building material, it is manufactured using three different processes that each offer unique performance properties that make plastic lumber a functional material that meets project requirements for numerous applications in many industries including marine, outdoor, industrial, and many more. HDPE plastic lumber is a dependable building material that can withstand extreme weather conditions like rain, snow and heat and cold. It is resistant to insects, mold, fungus and crustaceans and won’t splinter, mold or degrade. Paint and other chemicals will not adhere to this material because it is innately chemical-resistant, allowing plastic lumber to pivot and glide across the basketball court with ease and has an increased resilience over traditional wood. Impact energy is also deflected better than wood due to recoverable deflection. Plastic lumber is manufactured from recyclables and is recyclable itself, and helps keep millions of pounds of plastic out of landfills each year. Not only is it a tough building material, but it also helps protect and conserve Mother Nature. Weaknesses include misunderstandings and misconceptions about plastic lumber that keep it low on the building material radar, and it is a heavy-duty material. High-quality products can sometimes cost a bit more upfront, and that can cause hesitation. It also expands and contracts more than traditional wood, so installation and manufacturer recommendations are extremely important for project success. As traditional wood watched to see who they would go up against for the championship, the game between aluminum and plastic lumber was a nail-biter from the beginning. Aluminum, being quite light on their toes, was able to gain a lead against plastic lumber in the first quarter. As the newcomer building material in the final four, plastic lumber had to prove themselves a worthy contender throughout the entire game. In the final quarter, plastic lumber took a tremendous lead by showing determination and building material endurance, where aluminum started to slow down towards the end. Because plastic lumber is a versatile material that can be used in many types of projects and industries like marine, landscaping, parks and recreation, fencing and more, aluminum couldn’t keep up. This isn’t the first time that plastic lumber has competed against traditional wood for the title. Newcomer plastic lumber has fought its way to the top, and traditional wood has a history of winning, so this match-up brought a lot of viewers. As with any game, unexpected things happen, and in the championship game, traditional wood unexpectedly lost three of their top players due to injury and damage. In structural applications where harsh weather conditions are common, traditional wood just didn’t have the stamina and needed many replacements. Plastic lumber stood its ground and wasn’t phased by rain, extreme heat and cold and snow. It continued to hold up and the high-quality and heavy-duty building material remained durable, intact and performance characteristics were uncompromised. In the end, plastic lumber reigns supreme in the game against traditional wood, aluminum and PVC. While each building material gave it their all, at the end of the day, plastic lumber’s advanced skill set, durability and project endurance outlasted the other contenders. Become Project Champion with Plastic Lumber! Picking sides is never easy, but when it comes to a durable building material that will increase your project life-cycle and save your project money in the long-run, plastic lumber is the champion. Contact us today to get all of your questions answered!